A competition you would like to take part in. when would the competition take place? 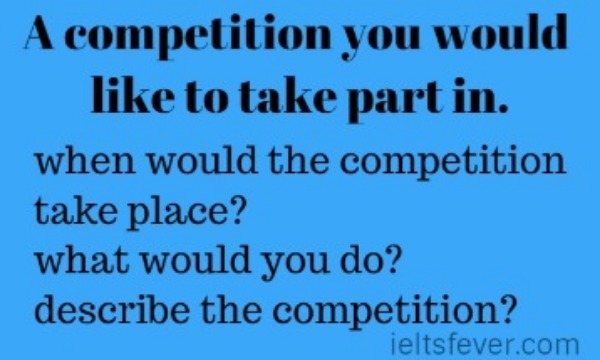 explain how you felt about participating in the competition? in this modern era, there is competition in every part of life.if one wants to achieve the success he has to go through several competitions in the society. competitions could be related to study, jobs, music, sports, entertainment etc.i fond of folk dance of Punjab.so I started participating in competitions since my school days. I won many prizes in folk dance in my school days. now I am doing my graduation from dm college moga. our class in charge told us that a university zonal youth festival is going to be held in our college within next two months. I want to participate in the folk dance competition.so I am very excited. I would do practice with work hard and dedication so that our team could win the competition. a coach is hired to give training to the folk dance team.we do practice in the college playground. there would be 7 teams from different zones who would compete with each other to win the first prize. different teams would wear a different color of folk dance dress. all the teams would have all kinds of folk dance instruments which would be used by different teams. there would be three prizes for the teams who win the first, second, and third place. I am feeling very excited to participate in the competition. I want to win the first prize in folk dance.that’s why all the team members work very hard and I hope with God’s grace we would definitely win the competition. A competition you would like to take part in. A competition you would like to take part in. A competition you would like to take part in. A competition you would like to take part in. A competition you would like to take part in.